The addition of sensors to a vehicle can provide extra benefits to drivers, such as parking sensors warning if the vehicle is getting too close to another car or another obstacle. While this is handy for close-range situations, it doesn't help when the vehicle is in motion on the road, at high speeds that have the potential to cause severe injury or death in some cases. 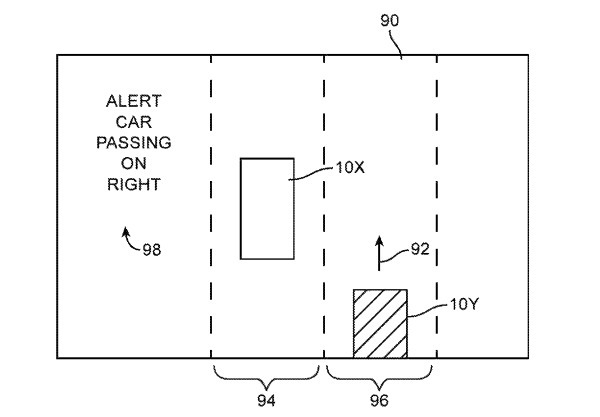 Apple's solution is described in a patent published on Tuesday by the U.S. Patent and Trademark Office, titled "Wireless vehicle system for enhancing situational awareness." In short, it is a system for how a vehicle can interpret wireless messages from nearby electronic devices to determine their location relative to the car and their motion, and use the information to warn the driver or to take evasive action. 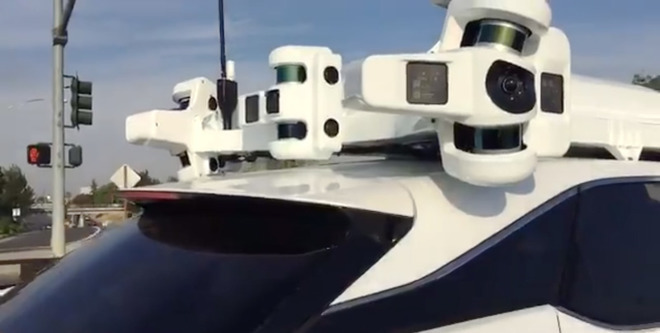 According to Apple's solution, a vehicle may have multiple transmitters located in each of the four corners, calibrated so that signal strength information can be adequately used in a similar system in another vehicle. Transmitters send out information about the vehicle, such as speed and size, as well as the location of the transmitter, which can then be received by a receiver in another vehicle. The signal strength for the received vehicle and the data from multiple messages can be used to determine the location of the transmitting vehicle. Satellite navigation systems can also be used to help refine the positioning of the secondary vehicle. Depending on the situation, an alert may be presented to the driver depending on the location of the vehicle and its type, as well as other information such as detected local traffic flows. Specific warnings could be advised for drivers in the presence of motorcycles, trucks, and emergency service vehicles. Apple files numerous patents and applications on a weekly basis, but while their existence indicates areas of interest for the company, it is not a guarantee that the concepts described will make an appearance in a future Apple product or service. While not mentioned in the patent, such a system would be useful for "Project Titan," Apple's ongoing effort to produce a self-driving vehicle system. While current tests involve a plethora of sensors on vehicles, the addition of transmitted data from other vehicles could provide more data for such systems to work with, and to make better decisions while on the move. Inter-car transmissions could help in other ways. In another patent from October, a "Peloton" system could create a caravan of self-driving vehicles in a line, allowing the convoy to save fuel and, in the case of electric vehicles, to potentially share energy between cars to minimize refueling stops.